UFOs are the most pulling sky phenomena of our day. You may laugh and ridicule the accounts of those who claim to have watched their strange antics overhead, but what of those who have actually laid their hands on UFOs that have landed and suffered various reactions? Is touching believing? A 51-year-old Polish immigrant became a believer when he touched a UFO in the Canadian wilds. The craft then took off with a rushing blast of heat that burned his shirt, gloves and· cap. For five months he was seriously ill.
A South American aeronautical engineer believes. 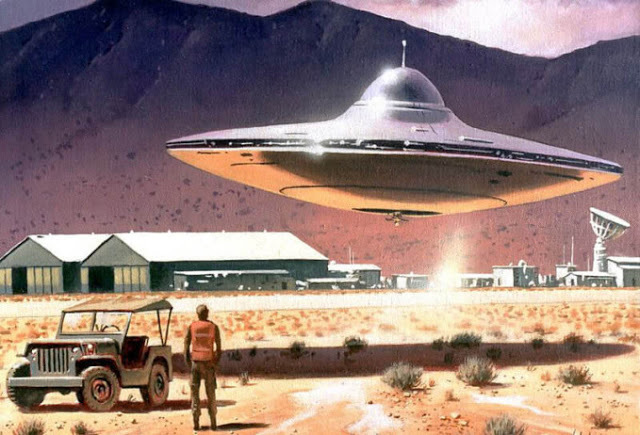 He stopped his car on the lonely Argentin_e pampas to inspect the inside of a “flying saucer.” He never forgot what he found inside the craft-and later he suffered strange, lingering, physical reactions. Yet, paradoxically, one man examined a UFO in a Pennsylvania field in the early hours of the morninq and after 40 years reported no aftereffects whatsoever. For protection against adverse publicity, he remains anonymous. We’ll call him Mr. Kelly, a resident of Lehigh Valley. At 2:30 a.m. on a warm summer morning in 1933, the 18-year-old Kelly was driving hls 1925 Ford Roadster from Nazareth to Lehighton. Between Cherryville and Moorestown, at a desolate spot on the road, his car had a flat tire. While changing the tire in the darkness lllis attention was drawn to a faint purplish glow in a nearby field. He stood up and tried to see what it might be, then, becoming more curious, he walked 200 feet to the light. There was a new moon but enough light filtered down from the stars to show the distinct outline of a strange, bell-shaped object lying on the grass. Kelly judged it to be about six feet high and 10 feet in diameter. He saw light coming from a slit on the side which on closer scrutiny , he found to be a circular door about a foot’ in diameter that was slightly ajar. Kelly pushed against it and the door swung open easily. He noticed it was built much like the door of a bank vault, with sealing steps at the opening rim and on its edges. The young man saw no one near the object so he poked his head through the opening and looked around the interior. The inside was bathed in a faint, peculiar light from the ceiling and at first he had difficulty making out the objects in the “room.” He judged the chamber was about six feet in diameter, about four feet high, and there was a dome in the center. He couldn’t see any windows. There was a console-like arrangement in the center of the floor and the Interior was crowded with tubing and dials. Several small objects possibly controls-were strangely curved. Kelly observed that the walls had a striated pattern-like marble-and that he saw no seats, beds, or anything resembling an air-lock. The young man also became immediately aware of a curious coldness inside the object and an odor similar to ammonia. After a few minutes of carefully studying the peculiar “room,” Kelly then began inspecting the outside of the bell-shaped device. There were no windows visible anywhere on the extremely smooth extirior. He ran his hand over it and found the surface to be metalll~ and cold. In all, he spent about 10 minutes examining the object, then he walked back to his car, finished changing the tire, and drove home. Thirty years passed before Mr. Kelly decided to tell anyone of his odd encounter. In 1964 he still had a vivid recollection of that dark night in the Pennsylvania countryside when he said: “I’d never heard of a flying saucer when I had this experience, and hadn’t the remotest idea what the object was. But now, looking back, I’m convinced I saw something not of this Earth-and perhaps not even of our planetary system. While I inspected the object I neither saw nor heard any living thing. In fact, the silence was deathly. But, it’s entirely possible I was observed,” from Japan comes the tale of a miniature UFO-and the boys who caught it. It was late August 1972. Two school” boys, Michi Seo and Yasuo Mori, living in the district of Kera on Shikoku Island, spotted the tiny object one evening at dusk. Observing its agile flight with interest, they first thought it was a bat. They soon realized that this strange aerial object couldn’t possibly be a bat; It moved too quickly! They would see it flying over the rice fields in one place, then-without seeming to accelerate-it would be seen In another area. The growing darkness soon caused the puzzled youngsters to lose sight of the object. The following days brought other reports of the same, or a similar, small disc seen in flight in the same area. They, young Seo and Mori, along with two other schoolmates, discovered the object at rest in a rice field. When they reached it; the disc was emitting a bluish light every few minutes. The boys ran to bring a friend, Sadao Fujiwara, but when they all returned to the site, the tiny disc was gone. In mid-September, the number of boys chasing ttie ·small object’ had grown to nine. Their efforts at capture were finally successful and they carried the strange thing to the home of Yasuo and Hiroshi Mori. Examining the object in detail, the boys found it was about eight Inches in diameter and weighed approximi:itely three and a half pounds. It had a small round hole in the back. The shape was like an upside down ash tray and it reflected light similar to dull silver. Cut In relief on the back of the disc was a very strange design that the boys attempted to sketch but Investigators later found their efforts very difficult to describe. Duripg the time the object was kept In the Mori home, it continued to glow Intermittently with a bluish or bluish-yellow light. Young Hlsaaki Kuzuoka’s mother also observed the glow when her son brought It home; she said it glowed like a fireflies. Curious about their strange catch, the boys decided to pour water Into the hole on the back of the UFO. When they did, it began to squeak. They then decided to put a wire into the hole and suspend it from the ceiling. When they did, a round lid opened on the back of the object. Gazing inside, they saw equipment similar to . radio components. Feeling this was a bit too strange to suit them, the boys tried to shut the lid. Despite their efforts, it could not be fully closed and a space of about 10 degrees was left. Checking later, they discovered the lid was completely shut and all attempts to reopen it with a screwdriver wern fruitless. The object was stiown to the father of one of the boys, a teacher at Nishi Senior High School. He scoffed, saying it was only a mold. One of the boys, Kei Kojima, wanted to keep it in his home for a while. The disc was placed in a knapsack on a bicycle for the trip. Along the way, it simply disappeared without a trace. About 10 days later, the boys heard a radio program featuring the well-known Japanese amateur astronomer, Osamu Seki who has gained international recognition through his discoveries of comets. Wishing to tell the astronomer of their experiences, the boys called the radio station and left a message for Seki, asking that he call them when the program was finished. Seki contacted a friend , Koichi Ike, whom he knew to be interested in UFOs. Ike visited the boys and reported their strange story to Seki. The astronomer was sci impressed with the account that he incorporated it into his recent book, In Search of the New Stars. Japanese UFO researcher Junichi Takanashi read the report in Seki’s book and publicized it in the UFO Newsletter of Japan’s Modern Space Flight Association. Interest in UFOs soared in Hamilton, Ontario, when an article appeared in the local newspaper on Apr. 2, 1966. It told how 13-year-old Charles Cozens had inspected and touched-two strange craft that had landed in a fie ld behind the Mounted Police Station on Upper Wellington Street. Several reports of UFOs over Toronto and Balmy Beach followed and a large green object was seen in the skies. One man told police he saw what appeared to be two stars flying parallel, one above the other. Suddenly they turned sharply, he judged at a 45-degree angle, and moved away erratically at great speed. The incident that started this UFO flap began when young Cozens ran up· to the two objects for a closer look. He said each was about ” eight feet long, four feet wide, and three feet high.” They have ” red, blue, and gr~en lights set into their rims and they flickered like a computer.” The ships glowed softly, he added. Cozens touched them and found their surfaces fo be hard and smooth. ” I couldn ‘t feel hot or cold,” he said . ” Only one of them had an antenna. It was thicker at the base and narrowed to the width of a nickel at the top.” He touched the antenna. When Charles Cozens returned home with his exciting story he was questioned by his mother, who called the local constable. It seemed the boy had a three-inch yellowish burn mark on his hand. The family doctor advised a test for radiation, but four days later a geiger counter reading showed no cause for alarm. Blood tests also showed no ill effects. Still the burn was observed closely for several weeks until it gradually faded and young Cozens suffered no further reactions from his meeting with UFOs. Dr. Enrique Carontenuto Bossa is a former WW II pilot and a respected aeronautical engineer. One April day in 1950 he was driving in the remote region of Bahia Blanca in the Argentine pampas. He was alone, and traveling to his hotel, 75 miles away. When the engineer sighted a disc-shaped object on the ground to his left, he stopped his car to investigate. Dr. Bossa decided the disc was one of the “flying saucers” he had heard about, and observed it from a distance for a few moments, all the while expecting it to take off suddenly. When it didn ‘t, he approached the object. There was an opening in the side of the craft and Bossa crawled up and looked inside. It seemed empty, but an amber colored light pulsated in the overhead dome every second. Although leery of the weird surroundings, his curiosity overcame his fear and he entered the strange object. The floor, he noted, had a curious rubber-like resiliency. There was a curved wall around the inside and there were three seats. In two of them sat miniature men dressed in brown, one-piece, tight fitting garments that covered their entire bodies except for their faces. Their light-colored eyes were open and their skin was “tobacco-colored.” Bossa saw another small man sitting, sprawled, in another seat in the exact center of the object. All the occupants were lifeless. On top of this gadget was a glass-like rotating globe that seemed to turn in. time with the overhead rotating light In the center of the cabin’s ceiling. For some reason Bossa had a strong urge to touch one of the little occupants. When he did, he found the corpse to be rigid and at that moment, Dr. Bossa began to experience an overpowering feeling that he was in the presence of an alien or strange form of life. He climbed out of the disc, ran to his car, and drove at high speed to his hotel. There he told two close associates of his discovery and convinced them they should return with him to the landing site. Because of darkness they delayed until the following day but could not leave until the afternoon due to torrential rains. They drove to the exact spot, but found no saucer. A search revealed only a small pile of grayish ashes that were warm to the touch. When the three men handled the ashes they were surprised to see their hands turn a sickly green color. (The same phenomenon has been described by persons who have handled “angel hair,” the ephemeral substance often associated with UFOs.) They siphoned some gasoline from the car and washed their hands. Then, suddenly, one of Bossa’s friends pointed to the sky. High overhead were two silvery-gray disc-shaped objects and at a much higher altitude they saw a blood-red cigar-shaped form. The discs hovered in the air for a few seconds, then merged with the cigar-shaped object, which then tilted upward and shot out of sight. Dr. Bossa haCt worn green-tinted mglasses when he inspected the interior of the strange craft, and although he had not come in contact with the ins.Ide walls or instruments, he had touched the outside skin of the disc when he entered it. Now, soon after they left the site, Bossa began to suffer severe aftereffects. In the following weeks the engineer fought drowsiness, a slightly high body temperature, and a strange blistering of those areas of his skin that were exposed when he entered the strange ship. Wherehis glasses had covered his face, however, there was no reaction at all. Greenish spots appeared elsewhere on his skin but when he applied an antiseptic, they cleared up. Bossa consulted several physicians, none of whom could diagnose the ailment. Investigators found Pr. Bossa’s reputation to be without reproach. He was a serious, professional man in good social standing “and it was difficult to imagine him perpetrating a hoax. About the time Dr. Enrique Bossaeri countered the UFO in Argentina,12-year-old David Lightfoot of Amarillo, Tex., had a similar “touching” experience. On Saturday morning, Apr. 8, 1950, young David and his cousin Charles, nine, were fishing on a creek northeast of town. About 11 o’clock the boys’ attention was drawn skyward where they saw a rounded object in midair. At first it appeared be a balloon but as it approached from the south they knew it was not a balloon at all, but a small UFO. As it came within a few feet of the boys, David’s adventurous spirit was aroused and he began to follow the object. Charles tagged along at a distance. The disc circled slowly, then dropped out of sight behind a low hill to the north. David reached the top of the hill and saw that the object was low on the ground only a short distance away. Its diameter was about that of an ordinary automobile tire and it was abo!Jt 18 inches high, It had a rounded bottom and a flat, plate-like device on top, separated by a space ab.out an inch and a half wide. A rod ran through the center of the device. David came nearer and saw the front section was rapidly spinning. On top of the spinning portion was a peak with a spindle. The spindle, as well as the bottom part of the object, was stationary. The entire UFO .was bluish-gray and there were no openings. The1boy was so close to the grounded disc he could not resist the impulse to capture it. Quickly he sprinted down the hill and lunged at it. Later he sa[d that his fingers barely touched it when he experienced two sensations: ” slickness” and heat. Immediately, the top section spun faster, the object made a high-pitched whistling sound, and it began to climb rapidly into the sky in a straight line. As it flew away from his grasp the device spewed out a gaseous spray which, because he was so close, landed on David ‘s bare arms and face. Within 10 seconds the UFO msappeared toward the northeast. Charles watched from 100 yards away and was surprised by the UFOs ability to rise and fly away so quickly. Both boys estimated the object’s time on the ground as about 30 seconds. In a short time, Daivid’s arms and face turned bright red and sm(!ll welts appeared. When he arrived home, ointment was applied and the welts slowly disappeared, although the redness lingered for a time. The first happened during June 1951 in Cambridge, Ohio, where Thomas P. Weyer, noticed a disc-shaped object in some grass along a sidewalk. The sunlight reflected from it and at first Weyer thought it was merely a chrome hub cap. He lifted it, turned it over, and saw it resembled two saucers joined rim to rim. l’t was about 15 inches in diameter and six inches thick in the center. Weyer said the disc’s bright and shiny metal surface felt warm to his touch, but he believed this was beoause it had been in the sunlight for some time. He judged it was only lightly heavier than an aluminum disc the same size might have weighed. There were no openings, protrusions, or markings anywhere on its surface. A puzzled Weyer laid the disc down for a moment and while he was momentarily distracted the object suddenly took off with a rushing sound and climbed rapidly Into the sky at a sharp angle. In a few seconds it was out of sight, and not even an exhaust trail marked its path through the sky. Fitch learned of a similar object that had been kept in a woman’s garage since its discovery. A Philadelphia radio moderator investigated the case and obtained an interview with the woman: The object was round, three feet in diameter, saucershaped, and grayish-white. The finder would not release it for analysis and a few days later, when the moderator returned for another visit, the woman inferred she had discarded it. Again, no aftereffects were reported by those associated with the discs. Fitch told of the two “captures” in the Bulletin of the Aerial Phenomena Research Organization. It was raining in Moneymore, Northern Ireland, on Sept. 7, 1956. For farmer Thomas Hutchinson it also proved to be an unforgettable day in his life. About noon Hutchinson and his wife saw an object fall from the overcast skies into a fill 250 yards away. Curious, Hutchinson pulled on his rubber boots and went out in the rain to investigate. It took 10 minutes for him to reach the spot because he detoured around hedge and stream obstacles by using country lanes. As he neared the object, the farmer saw it was an elongated, pointed sphere. It was three and a half feet in diametet at its thickest part and tapered to a width of two feet at the ends. It was red In color except for four white stripes around the center. On the top of the sphere there was a small, red, knob-like device. Hutchinson saw that the bottom of the thing was gathered, like the neck of a bag; but much more uniformly. It was resting on this base as the farmer approached. Hutchinson kicked It over. Immediately it returned to its original position. Hutchinson stooped and picked up the UFO by its ba.se ar:id it seemed to weigh less than 11 coup!e of pounds. He thought it didn’t feel like metal, but canvas-like. Immediately, the thing began to spin, although the base, where the farmer held it, remained motionless. He thou·ght it first spun counterclockwise, then stopped, and spun clockwise. And, Hutchinson noticed, the object was dry, despite the steady rain that continued to fall. Hutchinson held the spinning object at arm’s length as he began to head home. He chose the most direct route across the stream and through · the hedge. At the hedge, the farmer set the object on the ground to clear a better path through the undergrowth. The moment he released his grip, the object’s spinning accelerated and the mini-UFO zoomed upward and out of sight in seconds. As it sped away, Hutchinson noticed that the encircling white stripes now glowed brightly, as though reflecting su,nllght. In considering the power the object obviously had, Hutchinson wondered why, despite its spinning, it made no attempt to break away from him until he set it down. It seems that persons who physically come in contact with the small, remotely controlled UFOs usually don’t suffer any injury. Not so with the larger, “hotter” ones. Is there some relationship between the size of the UFO and the seriousness of contact injuries? The next account is worth pondering. On May 20, 1967, Stephen Michalak was 80 miles east of Winnipeg, Manitoba, atone in the Canadian wilds. The day was bright, sunny, and cloudless. An amateur prospector, Michalak was enjoying his outing, chipping away at an interesting vein of quartz. He wore gloves and goggles as protection against the flying chips. The 51-year-old man turned his attention to the other craft, which was also changing colors. Michalak saw it change “from red to gray-red to light gray and then to the color of hot stainless steel, with a golden glow around it.” He noticed an opening near the top from which a brilliant purple light shone so intensely it hurt his eyes and made red dots appear in his vision. Despite the bright midday sun, the strong light cast a purple hue on the ground. Although! caught up with mingled excitement and fear, Michalak held his ground and watched. Soon he felt pulsating waves of warm air’ coming from the object and the pungent odor of sulphur. He heard a soft noise, like the whir of a small, high-speed.electric motor, and the hissing of compressed air. As his fear subsided he took a pencil and paper from his pocket and sketched the object. Finally he approached to within 60 feet of the craft. Oyer the hiss of air and the sound of a whirring motor he heard two voices that sounded distinctly human. Now Michalak was sure the craft had an earthly origin and he stepped forward confidently and called to the occupants to come out. There was no answer. He called again-in Russian, German, Italian, French and Ukrainian. Again, silence. As he called out in English, he approached quite close to the object, and then decided to look ir;iside. After placing green lenses over his goggles he stared in wonder at the interior of the craft. He saw a maze of lights, with beams that ran horizontally and diagonally around the inside, and a series of flashing lights, all working without any particular sequence. He stepped back and noted the extreme thickness of the walls; they were about 20 inches wide. Then Michalak saw two panels slide over the opening and a th ird panel drop over them to completely close too aperture. He also noticed a small pattern on the side of the craft that seemed to be a ventilation or exhaust screen. When the amateur prospector touched the side of the ship he found it hot, even through his heavy glove. The surface had the appearance of stainless steel, but he couldn’t see any joints or welding seams. Then he noticed his glove. It was burned where it had touched the side of the craft! Suddenly, the object tilted slightly. Michalak turned and felt a scorching pain around his chest. His shirt and undershirt burst into flames from a sharp beam of heat that shot out at him from the craft. He ripped them from his body and threw them away, but he knew his chest was badly burned. The stunned man looked back at the ship and felt a s4dden rush of air engulf him. The craft quickly rose above the treetops and soon disappeared as had its sister ship. After this occurred, Stephen Michalak noticed the strong odor of a burning electric motor mixed with the p1mgent smell of sulphur that was to remain with him for several days. He also gaped1 as the needle of his magnetic compass whirled out of control before it finally settled down. As he inspected the landing site he became aware of a growing nausea. The spot where the craft had rested was swept clean. Now waves of nausea overtook him and he began to develop a severe headache. He broke out in a cold sweat, aware that something was seriously wrong. A feel ing of weakness engulfed him and he vomited. After a few moments, he picked up his equipment and started back to the bus station at Falcon Lake. The stricken man staggered along, navigating by landmarks, afraid to trust his compass. His mouth was hot and dry, his headache excruciatingly painful, and his stomach heaved every few minutes. The spots before his eyes returned. Again and again he became ill. He felt as if his chest was on fire, and red blotches appeared where the heat wave had blasted him. He had to remove his jacket because it irritated his raw skin. With every breath he smelled the stench of burning motors and sulphur; it seemed to come from within him and he could not escape it. Eventually Michalak painfully made his way home by bus and that evening went to the Misericordia Hospital in Winnipeg, where he was treated for burns and discharged. The next day he was no better. He could keep nothing in his ‘stomach and had no appetite. The day before, he had weighed 180 pounds; now he weighed 174. The news services picked up the story and as a result Michalak was subjected to a long and tiring series of questions and harassment by the press, radio, television, and government authorities. His condition continued to deteriorate and the family doctor was called in. Some of the tr,eatment was effective, but Michalak continued to lose weight at an average rate of two-and-a-half pounds per day. Seven days after his encounter with the strange craft, Michalak’s weight was down to 158 pounds. Repeatedly, he took blood and radiation tests, and the latter showed that he was not suffering from radiation poisoning. Slowly, his health began to improve and he started to recover the weight he’d lost. But three weeks after his encounter with the UFO, itching began and several blisters appeared on his chest. After medical treatment this condition disappeared. Then, one day at work five months after the incident, Michalak felt a burning sensation around his neck and chest. The pain grew intense; his throat burned. He immediately sought first aid in the medical dispensary where he removed his shirt arid discovered that his body was beginning to swell! Large red blotches had reappeared in the same places where the earlier burns had been. The superintendent took Michalak to a doctor and in the ensuing 15 minutes Michalak’s body turned violet. The swelling progressed so rapidly he could not remove his shirt again. His hands looked like inflated balloons! Michalak felt his strength sinking and his vision failing. The room spun and he drifted into unconsciousness. Under hospital observation the symptoms began to fade late that evening. Michalak’s strength returned and he was discharged the next day. The several doctors and scientists who were involved in the examinations of this man had different theories about his condition. One man said the shirt and body had been burned at the site by ultrasonic waves; another thought it was a thermal reaction caused by a blast of hot air under pressure. Radiologists who examined the landing site said Jhat radiation found there was a product of nuclear fission, similar to that emitted by an atomic reactor. Another physician found indications of gamma radiation that might have caused the burns and the immediate deterioration of recently-eaten food in Michalak’s stomach which could have produced the awful stench that seemed to come from within him. Another significant observation showed that the amount of lymphocytes in Michalak’s blood dropped from the normal of 25 percent to 16 percent, and returned to normal four weeks after the UFO contact. Despite his wearying ordeal, Stephen Michalak steadfastly maintained that his burns and sufferings were not caused by any aggressive acts of the craft’s occupants if there were any aliens aboard. He said he was simply too close to the ship when it took off. UFOs are not ephemeral ” ghosts” of the air, but solid objects, fully capable of being examined by Man-and responding to physical laws. Why reactions ranging from a mild rash to severe illness occur to some who have touched them and not to others, remains a mystery. But unknown craft containing, or controlled remotely by, human-like beings are flying in our skies every day-and have been doing so for many years. Think twice before you touch one!